Employing a friendly and knowledgeable Shetland Guide is the best way to make your holiday in our beautiful Islands truly memorable. Most of our guides are locals who hold an accredited guiding qualification, and can advise you on the best areas, sites and shops to visit. And they will be delighted to share those extra little surprises and ‘best-kept-secrets’ around Shetland that you wouldn’t experience on your own. Our Guides can assist with compiling an itinerary that is tailored to your interests and requirements. So no matter how long your stay, how big or small your party or whatever your special interest in any part of Shetland may be – we are here to help you make the most out of your visit, discovering Shetland’s archaeology, wildlife, geology, genealogy, history, botany, traditional music and culture. We promote the training and recruitment of multilingual Guides, so wherever you come from, you’ll receive a warm welcome in your native language. Most SITGA guides are affiliated to the Scottish Tourist Guides Association which is endorsed by VisitScotland**. All our Guides adhere to the STGA Code of Conduct and Standards of Performance. 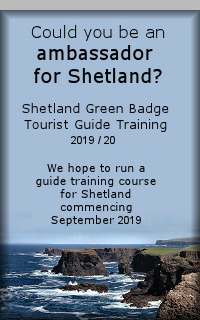 Shetland Islands Tourist Guides Association | Powered by Mantra & WordPress.